Fresh from representing Bolivia at the Concours du Meilleur Sommelier du Monde in Mendoza, Danish somm Bertil Levin Tøttenborg is crazy about the Jura region. Here he reflects on the world contest and working at top La Paz establishment, Restaurant Gustu. In general I do a lot of different pairings. Restaurant Gustu is based on tasting menus. Through a tasting menu with pairings you will be introduced to both wine, beer and cocktails; all of it being 100% Bolivian. 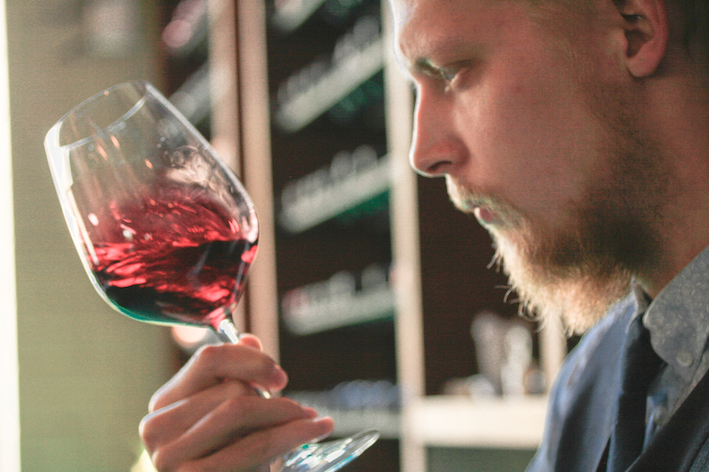 Gustu’s somm Bertil Levin Tøttenborg. I am the type of sommelier that believes in taste. I am not searching only for wines through out a pairing. If the dish is too complex to pair with wine you will have a beer or a cocktail matched completely towards the dish you are eating. One of the best pairings at the moment is for the dish that begins the tasting menu. It contains different varieties of fresh tomatoes, a Parmesan-style cream cheese, passion fruit and llajua (a traditional Bolivian chilli/tomato salsa; in this case made on chlili and lacto fermented strawberries). For this dish I serve a late harvest and oxidative Moscatel de Alejandria from a small biodynamic producer located in Valle de Cintí. The sweetness of the wine goes incredibly well with the salty cheese and the spicy llajua but still contains freshness and acidity for the tomatoes. I drink a lot of what I call ‘bedside table wine’. Fresh and easy going wine. Last night I had a bottle of 2014 Cabernet Sauvignon from Marquez de la Viña, which is located in Cochabamba. I love the producer and admire them for the personality they bring to a bottle of wine. In this case the wine doesn’t seem like Cabernet Sauvignon. For me it is the closest I get to find Burgundy in Bolivia. One might find it offends Cabernet. I find it charming. I think it is hard to call out a favourite wine region. I have always been very fond of Mosel, Burgundy and Champagne, but one region does make my mind crazy. Jura in France showed me how biodynamic wine can be done with no sulphites, serious personality and still keep a high quality level. I am addicted to acidity, oxidative wines and cheese as well as believing that biodynamic and organic production is the way forward. I think that this is the reason for my extraordinary love towards this particular region. When you can change the mind of a hobbyist. Biodynamic and organic wine production is still very new for many of my guests. It is scary and often doesn’t smell or taste like “normal” wine. But pouring a glass, explaining how it is made and actually convince the guest that it is perfectly normal (what is normal, anyway?) as well as the taste speaks for it self, is something I love. MacVin 2009, Gerard Villet, Arbois, Jura. During one of my trips to Jura, I was invited to a tasting at a producer named Gerard Villet. He and his wife Christine gave me a bottle of MacVin (a fortified oxidative Savagnin). The wine had just been bottled after six years’ ageing in barrels. I promised them to wait at least six years before opening it. I can’t wait to see the result. When I passed my sommelier exam, it surely was a highlight. But even before passing that, I was offered to become the head sommelier at the restaurant I was at. That turned my life around and made my next challenge come true. To travel to Bolivia and be part of a social project called Restaurant Gustu is one of the hardest but most amazing challenges I have faced. We are trying to change the mind of a whole nation and the way they understand their vast amount of possibilities in produce as well as gastronomy. I am now very close to the producers I work with, and that’s important. Maybe as well because you can have an effect on the direction they are going in with a new wine. What was a personal highlight about competing in the Concours du Monde in Mendoza? The whole experience was a highlight. From actually competing to meeting a lot of people that I admire. At the moment we are trying to set up a Sommelier Academy and Association here in Bolivia. So to meet that much support and interest was big. But the whole week was one of the biggest experiences I’ve been part of! Champagne! I want to mature, grow and evolve. Hopefully towards being better year after year.